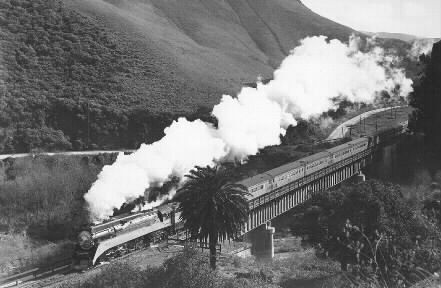 When I was a young boy, these magnificent Southern Pacific Daylight Limiteds traveled through my hometown of Santa Barbara, California. 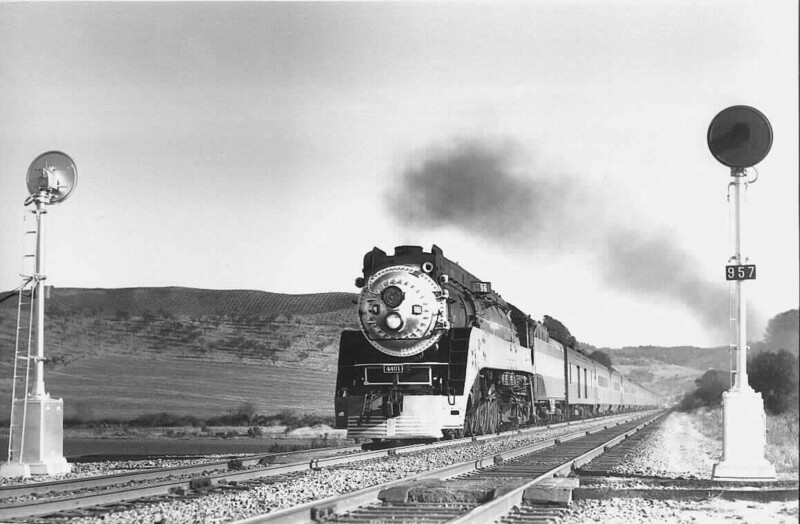 The morning northbound train out of Los Angeles, designated Number 99, would come through at 10:35 am. The afternoon train out of San Francisco, designated Number 98, would come through at 3:40 pm. You could set your watch by them! 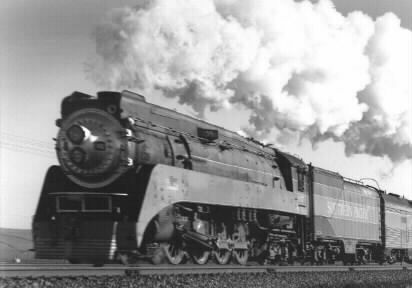 The southbound would take on water from a huge water tank on the west side of State St. My folks used to take me to the depot, just for the entertainment of watching these steaming, rumbling beauties as they loaded and unloaded passengers and baggage. They were born out of the Great Depression, and became the fastest, most beautiful, most luxurious way to travel on land in their day. 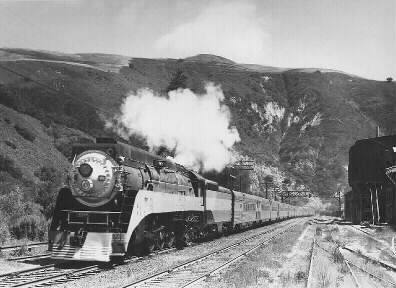 The Southern Pacific Daylight has been called "The World's Most Beautiful Train", a big reason was these steam locomotives. They are an unforgettable part of my past, and I dedicate this page to their memory, as only one GS-4 remains. I hope you will fall in love with them too. This was a test run of the first GS-2 to arrive on the property. 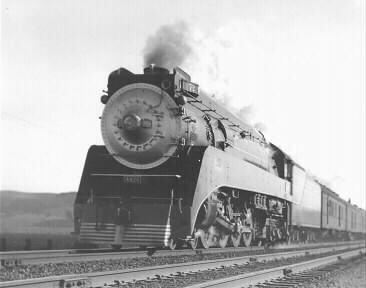 It is shown here on the headend of the Coast Local #72 leaving Watsonville Junction, California. Note the Lima test engineer in the gangway, 1937. Southern Pacific GS-2 4-8-4, #4412, is seen on test run of the "Daylight Limited" near Aromas, California. The train is running as second section of 2-70, 1937. The 1937 conversation over at the engine house at Watsonville Junction went something like this between Fred Stoes and the mechanic. "Yep, Fred! I'd be out there along the main somewhere today with your camera come train time for the #70. The brass are running a second section of the "Coaster." It is the first test run of the complete new 'Daylight Limited' and, of course, they don't want anyone to know!" In short order Fred found himself set up along the high curve at Aromas, California. It was still cold from the morning high fog that was just begining to break up over the valley. The wind was slightly blowing, moving the clouds around. And then he heard it. Off in the distance the mournful cry of the air horn on GS-2 #4412 broke the silence of the quiet Pajaro Valley. In almost no time at all, as if out of Camelot, there it was in its sleek warm colored body pounding the mainline rails at speed, 79mph. The shutter clicked. This stunning image was the result. The curve near Cuesta has just been reballasted. 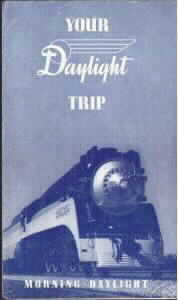 As the new Daylight tried to round the upgrade curve the locomotive drivers could not gain traction. Finally a 2-10-2 was called out from San Luis Obispo to add a little tractive effort. The entire time photographer Fred Stoes just waited. The final picture. 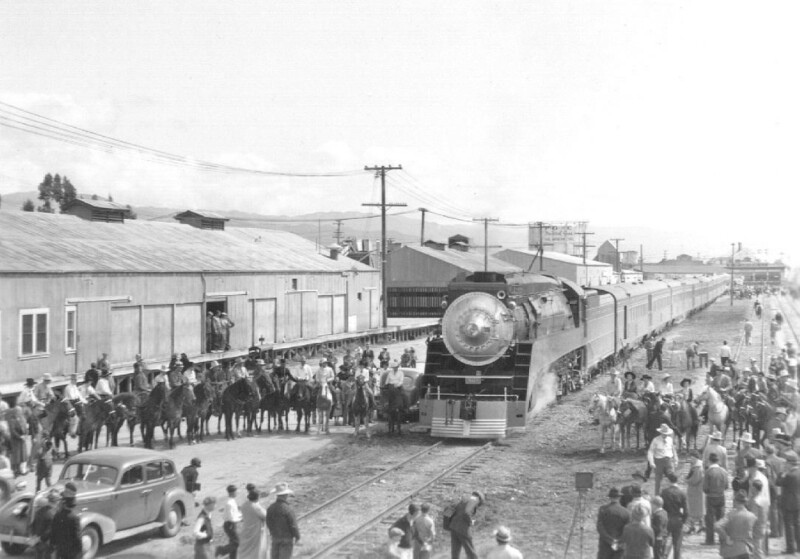 Arriving as the second section of westbound #69, the first public Daylight Limited arrives in Salinas. Note the children running alongside as the big engine comes to a halt. The first public Daylight Limited has arrived in Salinas, California. Officials, politicos, Rodeo representatives, and the general public are on hand for the event. 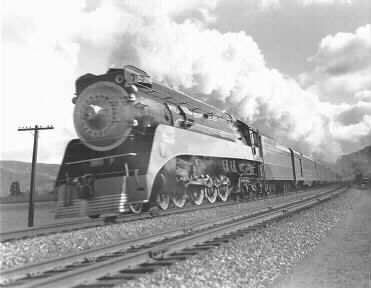 This original 1937 view depicts a brand new, high speed, eastbound, Southern Pacific "Daylight Limited" GS-2 pickin' em up and layin' em down on the two track main near Logan, California. Photographing a Daylight locomotive coming at you at 79 mph means you have to determine the depth of field. In this shot, #4420 is in focus at speed. Everything else is a blur! 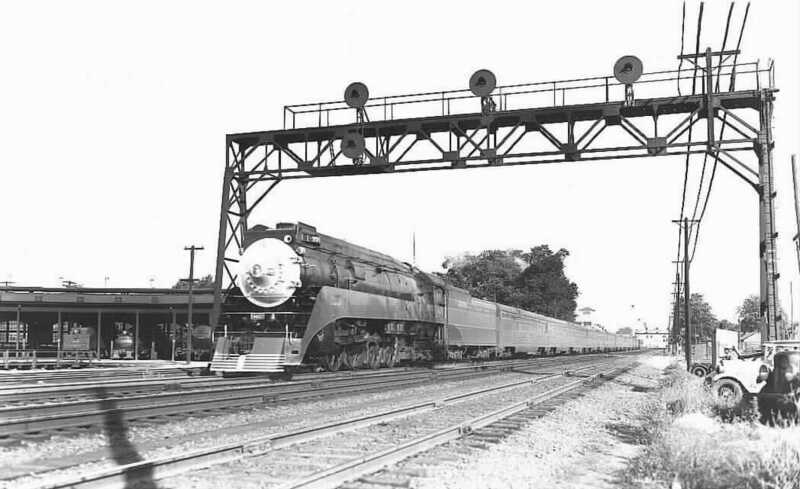 Under test, 1937. 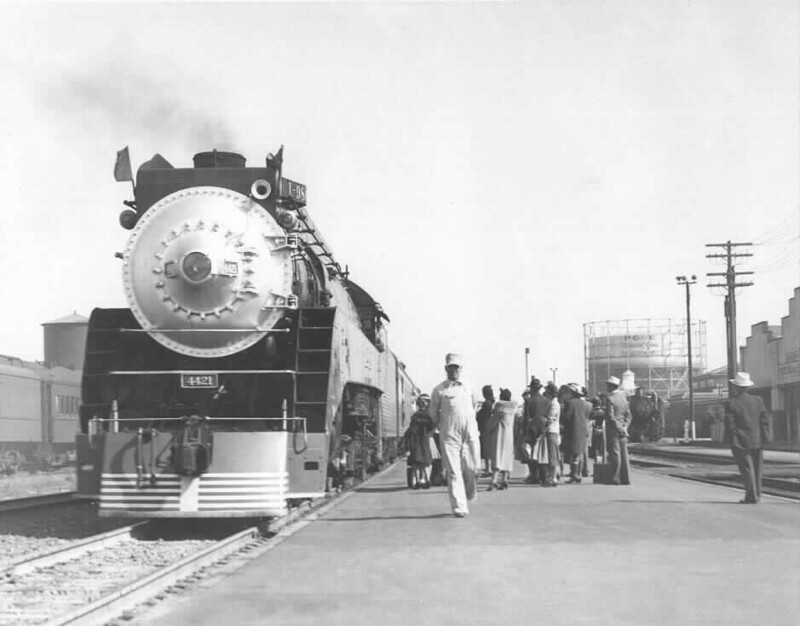 The engineer poses for the photographer in front of his new "Daylight Limited" locomotive #4421 at San Jose, 1937. The Southern Pacific Coast Division turns toward the ocean via a short pass through Pajaro Gap, rather than climb the mountain grade, to get to Salinas. In that short section of track is some of the most open country, with as fine a variety of scenery in California. It was here that Fred Stoes liked to shoot his pictures. Also, the fact that he was a railroad fireman through this section meant he had lots of time to study potential good shots. 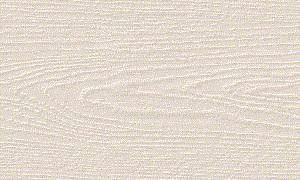 This is one of them! 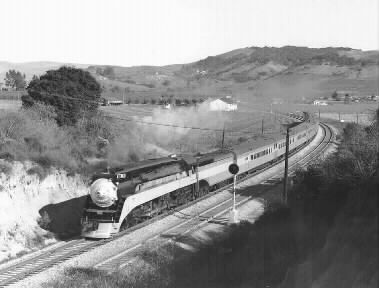 The eastbound "Noon Daylight Limited" #96 rounds the curve into a cut near Aromas. 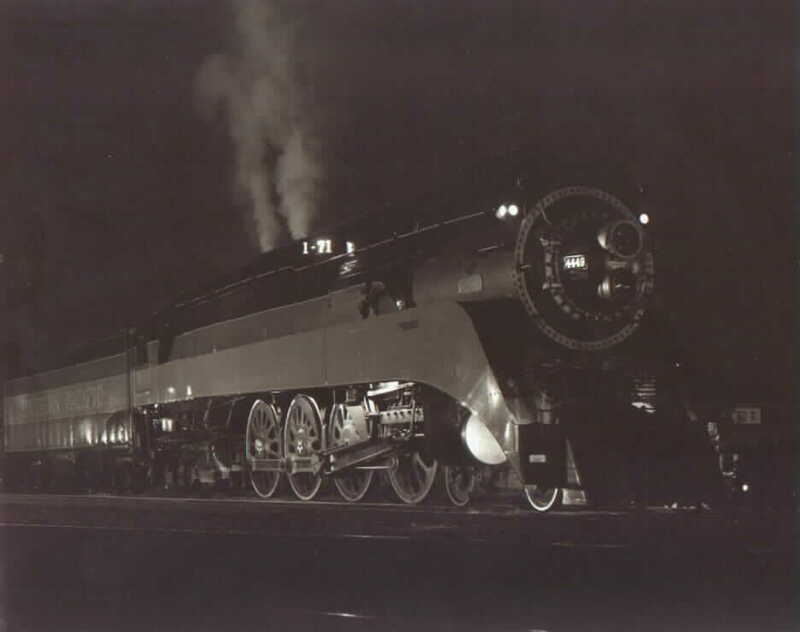 Everything from black to white is visible in this 1941 view. Block signal 851 in the foreground, GS-3 type #4421 with its drivers down and smoke back, the small farm town of Aromas in the background, and the Santa Cruz Mountains standing above it all. 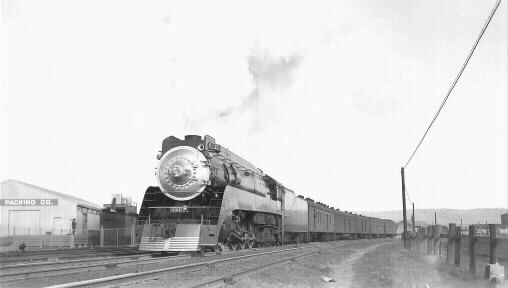 Southern Pacific "GS" 4-8-4, #4427, passes the San Jose Roundhouse with the New "Daylight Limited," train #99, bound for San Francisco, 5:00 pm, Sunday, June 27, 1938. Note the engines in the roundhouse, the old automobiles to the right and a few folks who turned out to see this depression breaker! 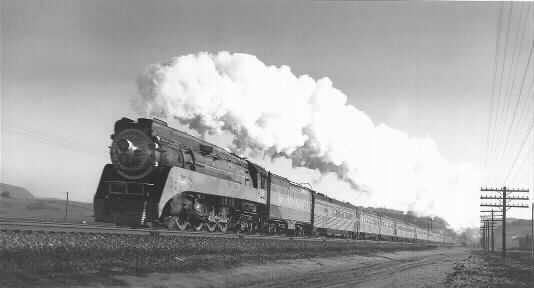 This 1946 photograph depicts a high speed, southbound Southern Pacific "Daylight Limited" charging the main through the Pajaro Valley at 79 miles per hour! The white, low, laid back, exhaust of the #4437 tells the viewer it was a cold, crisp morning and a very fast train. No longer in Daylight livery and missing its metal, this powerful 237-ton locomotive provides all the punch this six-car train of old 1919, 60-ft. long, Harriman's would ever need on the level. The train is San Jose bound, near Sunnyvale, California. It is a very cold 1947 winter morning in the Pajaro Valley. Fred Stoes has once again returned to his favorite place at Eaton's Crossing to capture a shot of the "Daylight Limited," #98, as it comes out of the Aromas cut at speed (79 mph). Drivers down, smoke straight back, the 20-car train in bright sunlight, another image captured for posterity. An older GS-4 #4449 sits at the ready at Watsonville Junction waiting to return to San Francisco with the Suntan Special, once it comes in from Santa Cruz. 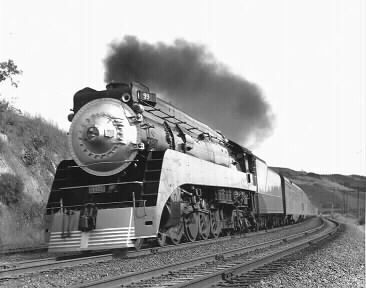 Who would have ever thought when this picture was taken in the early 1950's that this engine would go on to be probably the most photographed ever in the history of steam. 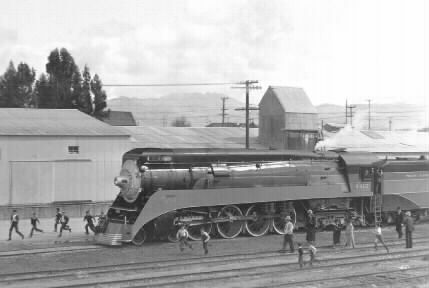 The Golden State Lady, #4449 pauses at San Luis Obispo during the year of the Bicentennial. It is now 1:00am. 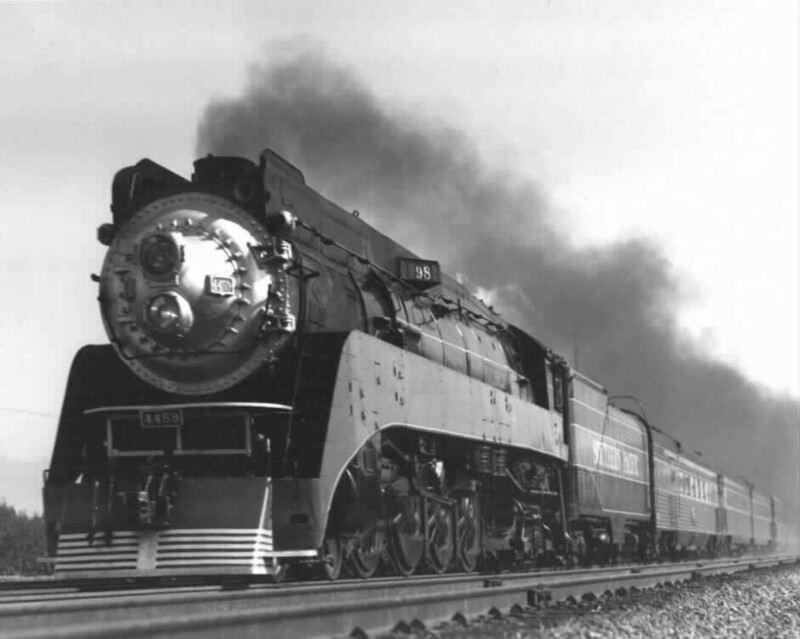 For those who care, the crew is switching the numbers in the numberboard to those of all the various old Coast Division trains that routinely saw a 4400 series Daylight type engine on the headend. 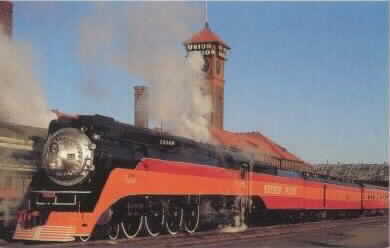 Southern Pacific #4449 works a special marketing train for company customers on this 1980 day. It is coming around a curve just north of Salinas at 79 miles per hour. 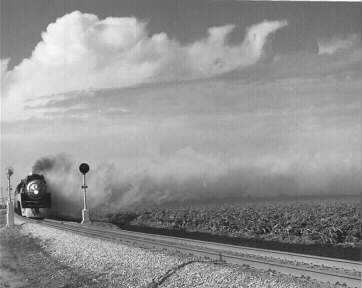 Note how the morning fog and locomotive smoke blends together and hides the train in the curve except for the engine and first couple of cars. Also, on this particular day the president was on board. He told the crew, "Now I don't want you to go over 79 miles-per-hour. But, I also don't want you to go under that, either." The bright sun has finally broken through the morning clouds of fog in the Pajaro Valley. 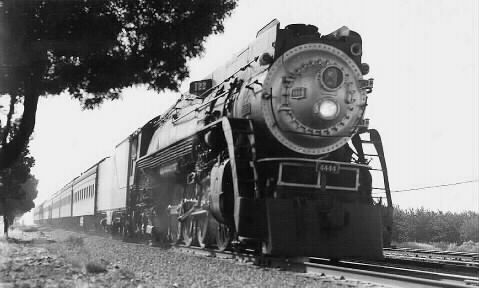 In this almost perfectly framed view a Southern Pacific GS-4, #4451, is seen on the "Noon Daylight" near Eaton Crossing at speed, 79 mph. 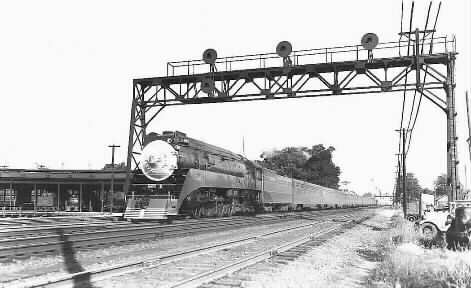 In this nice shot by a Southern Pacific photographer in 1945, the Daylight Limited, pulled by GS-4 4452, is seen crossing the Pajaro River Bridge at MP 92.37. This bridge was the third structure at this crossing and built only a few years before this shot. This 1947 photograph depicts a high speed, southbound, Southern Pacific "Daylight Limited" charging the main through the Pajaro Valley at 79 miles per hour! The 4-8-4 #4458 was the heaviest class of Daylight locomotive built. Because of its experimental Timken roller bearings on engine and tender, it was classed a GS-5. Otherwise, it and the GS-4s were the same. 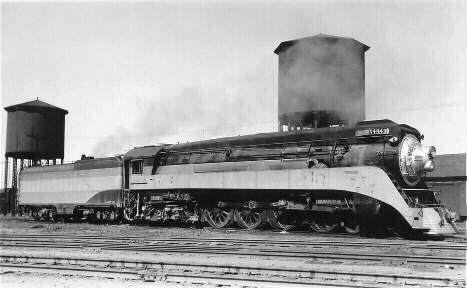 Locomotive #4459 the other GS-5, was equipped with SKF experimental roller bearings. The Southern Pacific "Daylight Limited" is seen at Logan, California, home of Granite Rock and the Logan Quarry. 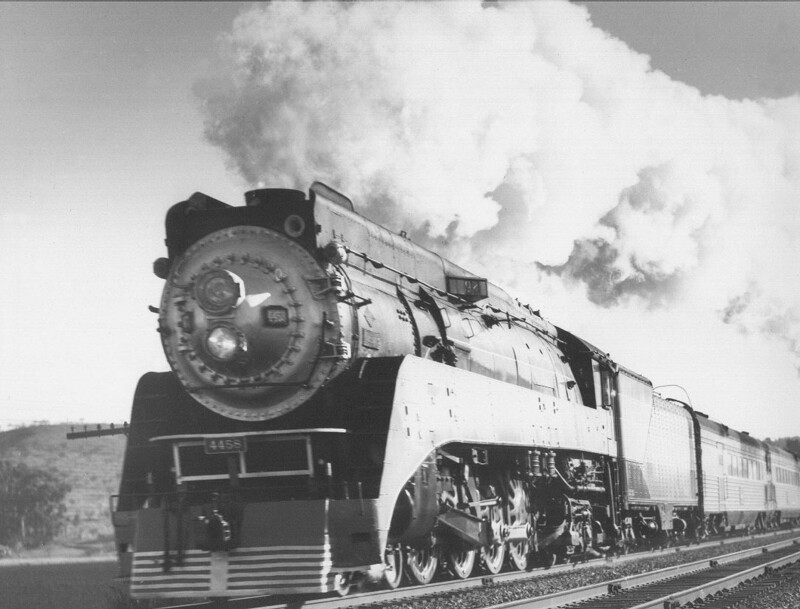 The train, pulled by 4-8-4 #4458, has just crossed the Pajaro River and run through Chittenden Pass. 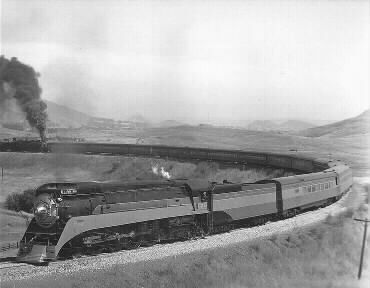 Southern Pacific 4-8-4 #4459 is on the head end of the "Daylight Limited", #98, as it charges the main through the Pajaro Valley at 79 miles-per-hour. The 4459 was equipped with SKF roller bearings on engine and tender and classed as a GS-5 because of it. 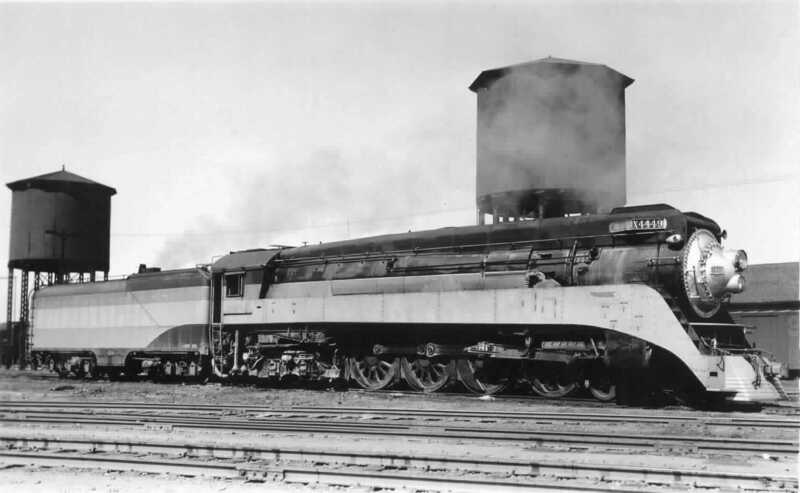 Sister locomotive #4458 was the other GS-5, but equipped with Timken roller bearings.